In an era of ever-advancing phone technology, can nostalgia give a boost to a not-so-smartphone? The Nokia 3310 — a beloved phone model that’s been out of date for a decade — has been relaunched as a new, colorful, pared-down phone for sale by HMD Global. The new phone, which costs just more than $50, debuted at an expo in Barcelona. It’s a “feature phone,” the industry term for a device that doesn’t have the capabilities of a smartphone. But it’s definitely been upgraded since the early 2000s; this model has a camera, a color screen and an mp3 player. Not everyone was impressed. Chris Smith of BGR wrote that the new phone “feels light and cheap” and called the use of the Nokia 3310 name a “marketing trick” to bring attention to HMD Global’s new Android smartphones — also under the Nokia brand. “But a few die-hard fans refused to retire their devices, noting the convenience of a battery that lasts for days. And even those who moved on to shinier smartphones still fondly remembered the 3310 — and as touchscreen after touchscreen shattered, they thought back wistfully to the old phone’s near-indestructibility. Time will tell if the new model has the original phone’s legendary durability. As for battery life, HMD Global boasts that the phone will last for up to a month on standby. But the company says if you’re using it to talk, you’ll get about 22 hours — which is hardly unprecedented, even for smartphones. 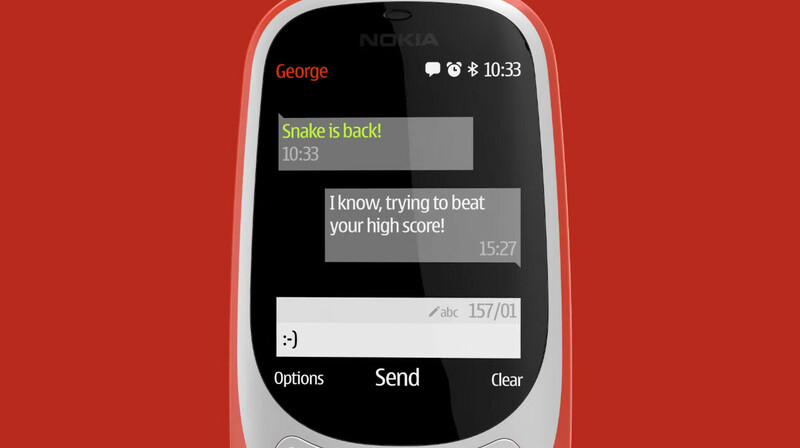 But there’s one trait from the original phone that’s definitely still available: Snake.